LeBron James is transitioning from being a basketball player into a political activist. LeBron is probably in his last few seasons but he won’t be leaving the stage with the announcement that he will support a school in Akron, Ohio and produce television shows. One of those television ventures will be called Shut Up and Dribble, the name comes from a cable TV news talking head’s mouth and will explore a history of athletes protesting. 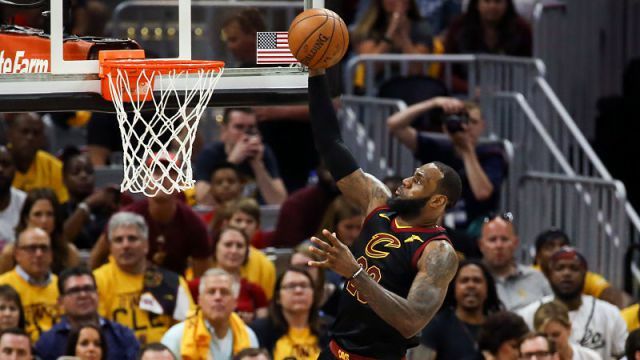 LeBron James has plenty of material with names like Jerimiah Mahoney from 1935, the African American American Football League players who boycotted the 1965 AFL All Star Game in New Orleans because of Jim Crow. Muhammad Ali’s refusal to enter the military service in 1967. Billie Jean King fighting for equal rights for women not only on the tennis court but in other aspects of life along with Curt Flood who fought Major League Baseball’s reserve clause. It seems the shows will look at basketball players’ protests over the past four decades. Long before National Football League quarterback Colin Kaepernick decided to protest by taking a knee during the national anthem, there was Denver Nuggets player Mahmoud Abdul Rauf who in 1995 staged a protest because of what he perceived was social injustice in the United States. Abdul Rauf was suspended for a game, and then work out an uneasy truce with NBA Commissioner David Stern and his owners where he would pray during the anthem. His career ended not too long afterwards. LeBron James and his production staff should present the story of the Chicago Bulls Craig Hodges who in 1992 confronted President George Bush during a White House celebration of a Bulls NBA championship about social inequities. Hodges, who was a 32 year old free agent, never got another contract. LeBron James won’t be told by some talking head to shut up and dribble.